Have you heard about the strategies and ideas behind marketing to an influencer in order to get one to promote you in their content? The question is why should an influencer do that for you, and the many others constantly asking them for the same things? Is this even the right way to go about building influence in order to increase traffic to your website, leads and sales? I want to share with you why many have it all wrong and six steps you can take to move away from trying to influence your industry leaders and instead focus on becoming one. Influencer marketing has become one of the biggest rages out there. So much is being written and said about influencer marketing and trying to reach influencers. However, I want to offer a different perspective on this subject from a different perspective. Instead of trying to reach influencers, why not focus on becoming an influencer? In this article, I am going to offer you six ways that you can think about how to position yourself as an influencer and build influence with your own audience who will carry your message, instead of trying to manipulate your way into a big influencer somewhere in hopes that he will give you access to his audience. I’ve got to tell you that influencer marketing has become such a prevalent thing that it’s getting harder and harder for someone to manipulate their way into an influencer. First of all, anyone with any level of influence knows what’s happening and what’s going on. Before I give you the six tips I want to tell you one thing you shouldn’t do and in this happens to me every single day. I have to admit, what I’m about to share is very frustrating to me. I don’t consider myself to be a top-tier influencer . I don’t have the audience or resources at this time like Gary Vaynerchuk, Mari Smith or any other influencers at the top you may know. However, what I do have is a nice size audience. It’s not the biggest and it’s not the smallest. but it’s one that takes action and really that’s the definition of an influencer. Influencers inspire their audience to do something, and they take action when you asked them to do it. Now, here is what frustrates me… I get these emails from all kinds of content marketers and marketing agencies asking if they can contribute to my blog. Allow me to ask; what’s the benefit to me and why in the world would I want to take content from somebody I don’t know and give them access to my audience? Let’s get on with the main point. Becoming an expert in your industry or field is more than just creating content and building traffic to your website. As I said earlier, influential experts are just that… they become influential with their audience so that when they ask them to take action, they do. Have you given your audience a reason consider you as an expert? Have you given them a reason to label you as an influencer? If you are not clear about who you are as it relates to your audience, then how are you going to be clear about what the problems, needs, wants and desires are of your audience and how will you position yourself as relevant to them? Your message is fundamentally the number one most important thing to your business. It’s also fundamentally the most neglected thing that most businesses leave on the table. What your messaging does is vital! It defines your vision and how your vision, in turn, enables your mission. Your message is what establishes you with the audience as being competent. I have to tell you, I’ve had some interesting conversations over the years on this topic. The truth is that people buy from you based on competency. In the beginning, it has nothing to with someone knowing, liking and trusting you. That comes after you establish yourself as being competent. Now if you’re just a jerk, then it doesn’t matter how competent you are. The reality is that you have to give people a reason to label you as an expert. You’ve must give them a reason to label you as an influencer! You do that by competently and succinctly presenting your message over and over, and over, and over again. When you establish your message, you establish the difference that you make for your target market and your earn loyalty because you’re talking to their problems, needs, wants and desires. The result is that over time you will build the audience who will see you as their influencer and an expert of choice. Coming out your message, you have you to discover the problems you solve from the individual prospect or customer’s point of view. Until you know what they are you can’t make a difference for those whom you are trying to attract. You have to figure out how to position yourself so that the people understand how you’re going to make a difference for them and why they should buy from you over a competitor. Why should they follow you over another “influencer”? What makes you different from everybody else? How you make a difference through solving a problem meeting a need, or fulfilling a desire is a key point to becoming an influencer. If you sound like everyone else, create the same content as everyone else, or seem to just be repeating others, then it doesn’t demonstrate that you can provide a solution and lead your followers to where they need or want to go. You have to figure out the right way to deploy your message in the time, space and way that is relevant to your audience. You must deploy your message in such a way that people are inspired by it and are ready and willing to take action. That OMG moment is vital! That’s an awesome OMG moment!!! I get these regularly… wouldn’t you like the same response? That’s what you’re looking for! Are you deploying your content in the places where your audience is at and where they can consume it? Building influence is a process of deploying your message in the in the sweet spot. Don’t just leave it to your blog to extend your message. You need to use other media formats such as audio podcasts, video, email, and other websites. There are many different ways to deploy your message through different media’s and you don’t want to ignore the opportunity to build influence with people who consume content in different places. That means don’t let your message exclusively reside on your own website. If you connect with the right people because your content has proven and demonstrated you as competent, you can get interviews on other websites and blogs, podcasts and more. There are so many ways that you can deploy your message and extend your influence! What would it do for your influence and expert status if you were able to get picked up in a major media outlet? Maybe you can contribute or get a story written to you in a major business journal or in a major US publication. When you create highly valuable content that solves one problem, for one person, with one solution you will find that opportunities will naturally come to you. The key is to make it easy to interview you. If somebody wants to interview in the media, or it could be a highly influential blogger, local newspaper, radio or TV station, make it easy! For example, my website has a Speaker page and I’m invited often to events to share because of it. In addition, why not consider putting an “Interview Me” page up on your website. On that page tell those who are interested in interviewing you how they can reach out to you. I’m actually going to take my own advice here and create that page in the next few days and add it to to the main menu at the top and bottom of this website. What Should Be on An “Interview Me” Webpage? On this page, there are a couple of must-have things. The key is to make it easy for the media to interview you . It starts with relevant content that gives the media a reason for the media to contact you. #6 – Don’t Forget to Use Social Media! I can tell you that I go to websites all the time and I am absolutely amazed how often there are not any social share buttons or links to connect with someone on social media from on their websites. How is someone going to become an influencer if people cannot share your content and expose it to their audience? You have to get the social share buttons on your website. Those little buttons are huge! Also, don’t forget to share your content out there share after you’ve posted it. Share it to your Facebook page, your personal wall, and then find some groups that make sense for you to be involved in and share it there as well. Share your content on Twitter. Twitter has been phenomenal for me! Every day I’m added to like five or 10 new twitter groups. It’s amazing how much exposure you can give yourself just by putting your content out there. Don’t create content and leave it on your blog. 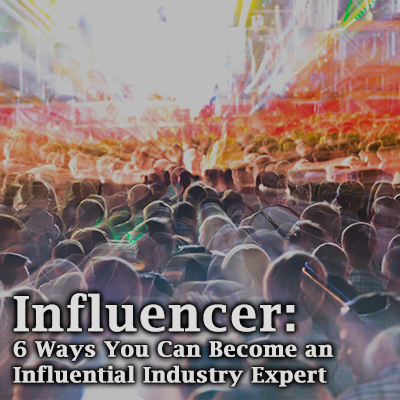 Over time and with consistency, these six tips can help you become an influential expert within your industry. Becoming an industry influencer isn’t something that will happen immediately, but it’s possible and it can change your business, life and opportunities forever! Do you have a question, thought or idea? If so, share in the comments below and let’s chat. Don is a marketing consultant and coach, and founder of Unveil the Web. He helps businesses discover who their customers are and what business they are "really" in through a five step process. He is an award-winning blogger and branding / marketing consultant.